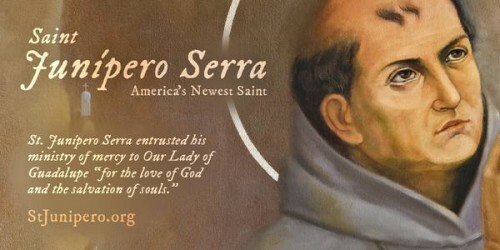 Born at Petra, Majorca, Spain, November 24, 1713, a son of Antonio Nadal Serra and Margarita Rosa Ferrer who spent their lives as farmers, Junípero Serra was baptized on the same day at St. Peter’s Church and was given the name Miguel José. The cause for Serra’s beatification began in the Diocese of Monterey-Fresno in 1934, and the diocesan process was finished in 1949. On September 25, 1988 he was beatified by Pope John Paul II. Pope Francis canonized Junipero Serra on September 23, 2015. during a Mass in Washington, DC.